Lijiang is a dreamlike, peaceful ancient town located in the northwest of the Yunnan plateau, and Lijiang has much to offer visitors. On your tour of Lijiang, you will be mesmerized by the enchanting Jade Dragon Mountain, famous Old Town Lijiang, beguiling Lugu Lake, ancient Shuhe Old Town, majestic Tiger Leaping Gorge, breathtaking Black Dragon Pool, ancient Baisha Village, and gorgeous Basha Murals. Besides the must-seeattractions in Lijiang, the city also has something to offer for gourmets. Tasty Sanwen fish, savory chickpeas, bean jelly, delicious Lijiang stuffed buns, and mouth-watering salted pork ribs hot pot will be a great feast to your taste bud along your Lijiang travel. Stroll along the ancient street to experience the peaceful atmosphere, stand on the arched bridges to appreciate the distinctive layout of this old town, listen to the unique rhythms of Naxi music at night to explore the profound Bongba culture. These are all what cannot be missed on your trip to Lijiang. 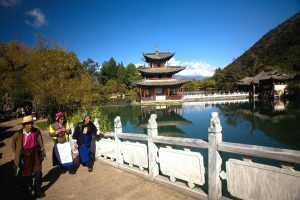 Take a look below at the many things to see and do in Lijiang along with our special tour deals! Jade Dragon Snow Mountain is the sacred mountain of the Naxi people, which is famous for its snow-capped peaks and magnificent momentum and attracts numerous adventure-lovers to pay a visit every year. The Black Dragon Pool is features gurgling brooks, tall peaks and mesmerizing landscapes which attracts uncountable travelers to pay a visit annually. Residential dwellings in the old town are characterized by simple structures with a distinctive layout and colorful decorations. In the yard, diverse plants grow and blends with the surroundings harmoniously. Stand on the arched bridges to capture the panoramic view of old town’s layout. Tiger Leaping Gorge is regarded as the largest gorge in China, which makes itself an ideal place for hiking. Location: Northeast of Pannong County, Jade Dragon Autonomous Prefecture, Lijiang, Yunnan Province. Impression Lijiang is a cultural show demonstrating the traditions and lifestyles of the Naxi, Yi and Bai peoples living in Lijiang area. The performance uses the Jade Dragon Snow Mountain as its natural backdrop, which is specifically designed to showcase the sacred mountains in Lijiang. The Basha murals are different in shape, vivid in facial expressions, fine in workmanship and deeply colored, where Buddhism, Taoism and Lamaism harmoniously converge in Lijiang. Sanwen fish are a local specialty that you should not miss, which features tender flesh and savory flavor. It is totally different from that of frozen fish that commonly eaten in daily life. Naxi music mixes lyrics and musical styles to create its own unique style, which is a must-see to fully appreciate the Naxi culture. Due to the favorable climate in Lijiang which is usually warm in winter and cool in summer, Lijiang has much to offer visitors. 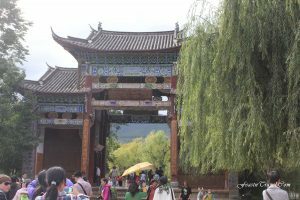 However, to visit more attractions in Lijiang, choosing the best time to visit Lijiang proves important. The weather in Lijiang in different seasons offers different landscape. If you travel Lijiang in winter, you would be rewarded with the snow-capped mountain landscape of the highlands, which is the best time to view these majestic mountains, however for Lijiang in winter, traffic problems may occur. 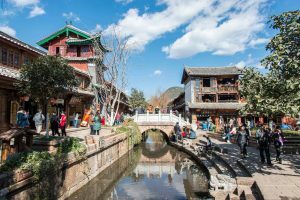 If traveling to Lijiang in April and May, you could easily appreciate most of the attractions Lijiang has to offer. The best time to visit Lijiang is autumn when crisp fresh air, blue skies, blossoming flowers, and verdant trees are all available. No matter when you come, Lijiang has something for you! 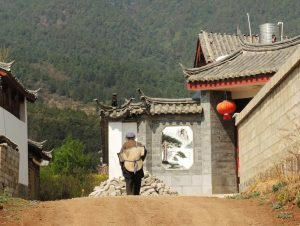 Lijiang is the main settlement where Naxi ethnic minority is located, which is the only Naxi autonomous region in China. Lijiang attracts numerous travelers to pay a visit not only for its enchanting landscape, but the unique Dongba culture created by Naxi people. The Dongba is the priestly class of the Naxi, and are a vital part of their culture, especially as it relates to their sacred literature. Browse below for details about Dongba culture. The Dongba script is a kind of picture-like hyroglyphic system both indicating meaning and sound. This written language is used by the Naxi people who inhabit western Tibet and northern Yunnan. It is thought the Dongba script originated from the Dongba Scriptures. Dongba scripture, also referred as Dongba jiu in the Naxi language, is a kind of literature written in Dongba script. Dongba scripture is the unique holy book of Dongbaism, the religion of Naxi people. The scripture is bound in Dongba paper made of the skins of a local plant, and is written with bamboo pens and ink. Dongba scripture is scattered among the upper reaches of the Jinsha River, which includes Lijiang, Zhongdian area and Weixi Autonomous County. Dondba painting is another essential part of Dongba culture. The content of Dongba painting is mainly focused on the traditional deities and ghosts of Naxi people and an imagined ideal world, which vividly depicts the social life of the Naxi people in ancient times. Dongba painting is mainly used in different kinds of ceremonies of Dongbaism. Dongba music is a kind of tone chanted by Naxi people during religious ceremonies and usually accompanied by other musical instruments, an integral part of Dongba culture. Dongba music is usually sung by Naxi people and is preserved in Dongba scripture and painting. Dongba dance is performed by the Naxi people when performing the religious rite of Dongbaism. Dongba dance originated from the social life of Naxi people in ancient times and many poses in the dance are meant to imitate the actions of different animals, which are very vivid and life-like. Dongba dance is an important component of Dongba culture. Lijiang cuisine, shown below, is made up of local favorites such as Sanwen Fish, Chickpeas Bean Jelly, Lijiang Stuffed Bun and Salted Pork Ribs Hot Pot. Tasting exquisite and authentic Lijiang food is most definitely worth your time as you pass through the city. Lijiang food offers the must-have Lijiang cuisine for visitors. The Lijiang food below is the local-best food of Lijiang, such as Sanwen Fish, Chickpeas Bean Jelly, Lijiang Stuffed Bun and Salted Pork Ribs Hot Pot. Tasting the palatable Lijiang food would be a great experience along your Lijiang travel. Besides must-serve Lijang cuisine, Lijiang food page also offers the local-popular Lijiang restaurants for reference. The must-eat Lijiang food is offers as below. Lijiang boasts the largest breeding base of Sanwen fish in China. Sanwen fish is cold-water fish, so the glacial melt water of snow mountain is particularly suitable for raising Sanwen fish either in water-quality or in water-temperature. The fry of Sanwen fish in Lijiang is introduced from Nowway. The Sanwen fish is featured with tender flesh and savory flavor, which is totally different from that of frozen products that commonly eaten. Sanwen fish is highly recommended. On the street of Lijiang, a famous snack named Chickpeas Bean Jelly is ubiquitous. Chickpea is a kind of soybean and it is just like the eyes of the chicken in shape, hence the name “Chickpeas” is given, which means chicken eyes in Chinese. Chickpea is main ingredient of chickpeas Bean Jelly. Soak the chickpea, grind the socked beans into soya-bean milk, boil it the milk until it turns gray-white and pour it into different-shape containers for modeling, then Chickpeas Bean Jelly is made. Seasoned with red pepper, green leek, green onions, mustard, vinegar and other seasonings, the chickpeas bean jelly is so luring in appearance and palatable in taste. Lijiang Stuffed Bun is a well-known snack in Lijiang created by diligent Naxi people, which is characterized by its luring color, crisp flavor and delicious taste. Wheat flour is the main ingredient for the Lijiang stuffed bun. Mix the flour with spring-water from Jade Dragon Mountain, smear plant oil onto it on the marble slate and roll the dough into a large thin piece. After scattering minced ham or sugar, roll it into cylinder-shape. Put the two ends of the cylinder together and press it into oblate-shape. Add sesame, walnut and others seasonings, bake with soft fire on the pan until golden-yellow, then the delicate round-shaped Lijiang Stuffed Bun is prepared. It has two flavors, salted and sugary, and you can choose either of them as you like. The main ingredient in the salted pork ribs hot pot is pork ribs salted with wine, sugar, and spice and other seasonings. After stored the salted ribs in a water-filterable wooden vat for 15 days, the pork ribs are fully permeated with salt and flavor of flesh and rib are well-blended. Later, dry them in the shady ventilating area for one or 3 months, then the savory salted pork ribs are prepared. Boiling them with other vegetables in hot pot, the Salted Pork Ribs Hot Pot would be a great feast to your taste bud. Features: One of the oldest restaurants with musical performance in Lijiang and singer shows are scheduled every night. Lijiang shopping offers some must-buy Lijiang shopping items and recommended Lijiang shops. Lijiang shopping page is a great guide for shopping in Lijiang. Dongba Tie-dyed Cloth is a featured decorative gadgets created by Lijiang people, which not only draws the merits of tie-dye craft of Bai ethnic minority and wax-printing craft of Miao people, but involves the Dongba culture elements. It is of unique aesthetic value and makes itself a popular decorative gadget among fashion-seekers. It costs about 50-200RMB for one piece. Yinjiu Wine is a kind of mild yellow wine produced in Lijiang and its distinctive brewing process has been created since Ming Dynasty. It was said that Elizabeth, an outstanding queen in United Kingdom, drunk the Lijiang Yinjiu Wine on National Banquette when paying a visit to China. It costs 15-80 per bottle. Chenghai Sea is one of the three largest spirulina producing base in the world, where high-quality spirulina platensis are offered. Spirulina is the most nutritious organism presently known to the human beings, which could lower cholesterol, expel toxin in kidney and improve immunity. It cost 60-300 per tube. Cordyceps is one of the famous specialties on Lijiang snowy plateau, whose nourishing and treating function is much higher than ginseng and velvet antler. Cordyceps are very expensive and it charges about 30000-40000RMB per kilogram. Naxi Murals is one of the delicate handicrafts created by local people, which could be displayed on the desk as decoration and is worthy collecting. It costs about 15-30RMB. Shuhe Town is reputed as hometown of leather cobblers, where leather bags with high quality fine workmanship and fashion design are easily available. Leather bags here charge far less than the brand ones, so if you are just attracted by its novel design, buying it here instead of in brand stores is highly suggested. Leather products ubiquitous in Lijiang Old Town is mainly made of cat skin or dog skin, and wolf and pard ones are seldom available. However, just for decoration purpose, these products are still workable. It often charges about 100-300RMB. Carvings in Lijiang mainly carved of Dujuan wood. Line carvings generally charges 50-80RMB, while the reliefs charges about 400RMB, which is totally decided by its size and craftsmanship. The same carvings displayed in shops would be charged twice as high as that displayed on street by vendors, so watching this kind of carving from vendors is highly recommended.